Want to design a beautiful nursery or kid’s room on a budget? Go buy a Sharpie Paint Pen! These easy-to-control crafting pens come in multiple sizes and colors and can be purchased at your local craft store. You can even buy metallic pens! (Perfect for adding a little glam to your project!) The cost? A whopping $5! That's right, folks. With a steady hand and a little patience, you can create a stunning feature wall for less than the cost of your regular latte. It’s a DIY’ers dream come true! Have a redecorating itch? Unlike traditional pattern work, which often requires multiple coats of paint to cover, this easy-on paint method is also easily painted over. A single coat should do the trick, making future updates a cinch. Just be sure to opt for water-based Sharpie markers. They work just as well as the oil-based variety but are easier to cover up. If you make a mistake, just paint over the error and try again. Easy! Ready to get your Sharpie skills on? 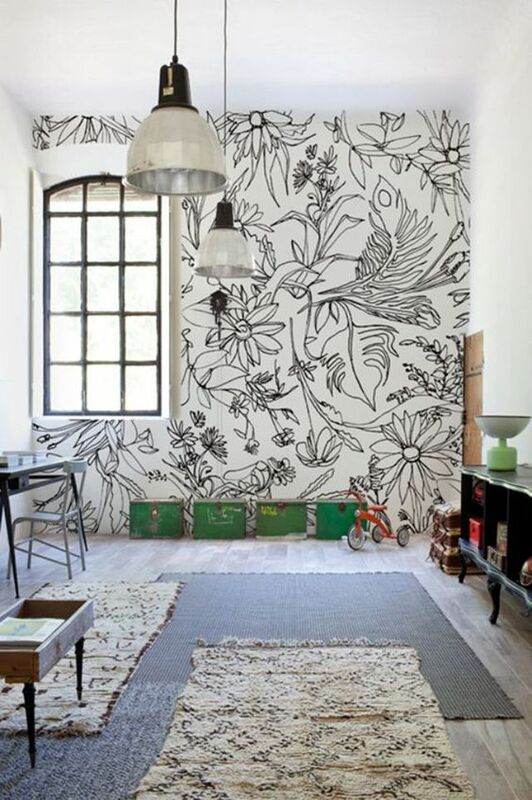 Get inspired with these 16 beautiful Sharpie art wall ideas! Photo via Preparing for Peanut. This gorgeous chevron accent wall, created by Becky, the multi-talented mom and blogger behind “Preparing for Peanut(s),” took just a few hours to make. To recreate Becky’s impressive design, you’ll need a long rule, a level, and a couple of Sharpie Paint Pens in different colors. To see more photos (including an animated GIF of the whole process), check out the full tutorial here. This eye-catching Sharpie paint pen accent wall, created by Michelle Hinckley of 4 Men 1 Lady, brings a playful touch to this tween boy’s bedroom, and can easily be painted over as he matures. Sleep under the stars with this easy DIY sharpie mural idea created by John and Sherry of Young House Love. John simply printed photos of well-known constellations and used a straight-rule and a metallic-silver Sharpie to recreate them on the wall. Sherry followed behind adding a dot everywhere the lines intersected. They then filled the empty space with more dots in different sizes, giving the appearance of other distant stars. The finished project? Out of this world! This whimsical Sharpie wall mural, created by artist and soon-to-be mom Hillary Moore of The Quietest Noise, transforms a plain-Jane corner into woodland wonderment. Have a little Picasso on your hands? You’ll love this easy-to-recreate Sharpie wall idea spotted on HonestlyWTF! 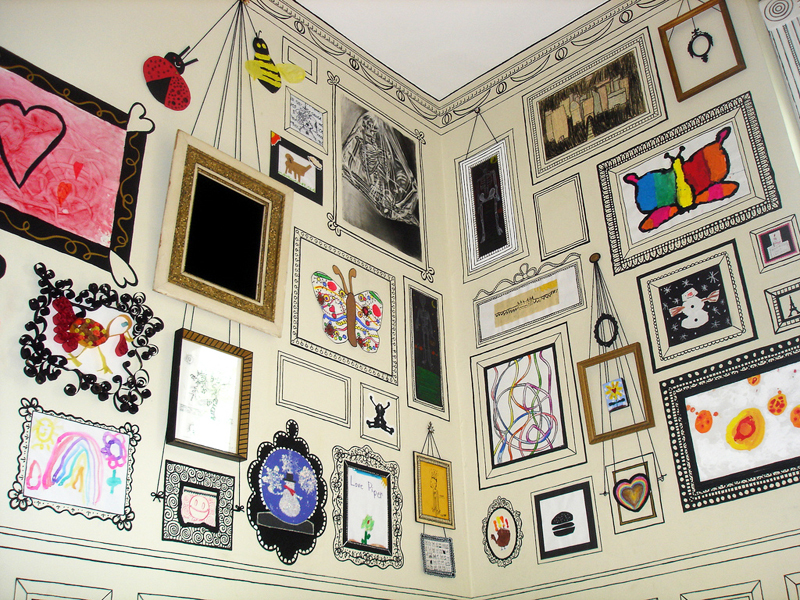 Create a hand-drawn gallery wall featuring a variety of frames in different shapes and sizes, and allow your little one to tape his or her latest masterpieces directly to the wall. Genius! Crushing on the tribal trend? This metallic gold Sharpie Accent Wall created by Roeshel of DIY Show Off couldn’t be more on point! Gotta have your own? You can find Roshel’s full tutorial right here. Give your little adventurer the world with this easy Sharpie mural idea spotted on Burlap & Denim. Use a projector to magnify an image of the world map onto the wall, adjusting the scope until everything is right where you want it. Then carefully paint over the projected lines with your Sharpie. Large-scale, three-dimensional diamonds set against rich navy surroundings pop off the wall in this simple yet stunning geometric Sharpie mural featured on Small Fry. An elegant tangle of birds and flowers hand-drawn with a Sharpie Paint Pen adds the perfect touch to this somewhat contemporary yet farmhouse-inspired space featured on U-Create, offering a modern take on a traditional floral print. Want to get the farmhouse look for less? If you love shiplap walls but can’t afford to install a wood-paneled accent wall, pick up a Sharpie instead! DIY maven Cassity of the popular blog Remodel-aholic drew the faux shiplap lines in this charming country girl’s room with a pencil and a straight rule and then traced over them with a grey paint pen. The entire project took just over an hour to complete and just looks like the real deal. Gold, diagonal pinstripes, painted using a metallic Sharpie Paint Pen and set at different angles, give this simple all-white space from Cuckoo 4 Design a sophisticated feel, while gold polka-dot ceiling decals add a touch of unexpected whimsy. The brightly hued geometric wonder wall in this fun modern teen room featured on Solebich could not be cooler! The eye-catching colors and three-dimensional shapes seem to jump right out at you, bringing an energetic vibe to the space for the cost of a pack of Sharpies. Dreaming of a statement making accent wall for your nursery or kid’s room? Use a projector and a Sharpie to fill your little one’s head with visions of furry nighttime friends by recreating this gorgeous constellation wall from The Adventures of Mike, Kasey, Riley and Scout. 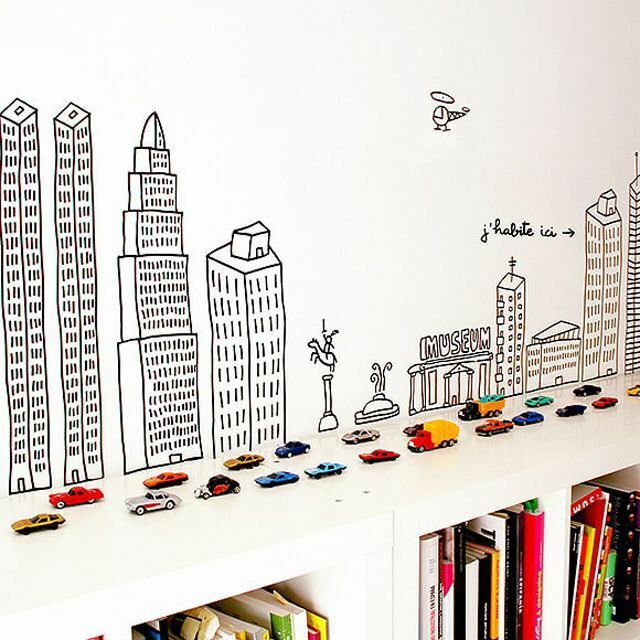 Whether he’s a Matchbox maniac or a super hero in training, this adorable hand-drawn cityscape, like this one spotted on Handmade Charlotte, is the perfect way to fill a wall in your little boy’s room. Simply draw your masterpiece in pencil and then trace over it with a paint pen in a color of your choice. Yet another nod to the geometric craze, this simple and chic triangle Sharpie wall spotted on DIY Passion is giving us a serious case of nursery envy! According to DIY goddess Erin Trafford, the project took just a couple of hours and only $8 to complete. Want more details? You can find her full tutorial right here. This fun and funky Sharpie accent wall, hand drawn by Alexis of Persia Lou, adds just a pop of pattern to a striking green space, complimenting the room’s bold style without overpowering the design. Looking for more inspiring DIY projects? You love these 15 Creative Nursery Walls Ideas!